The 1950s saw the beginning of a concerted campaign to increase the area of cropland in then Soviet Central Asia. This expansion was made possible by large increases in the volumes of water diverted from the Amudarya and Syrdarya to irrigate the fields. For all crop types, the total irrigated land in Uzbekistan rose between 1965 and 1990 from 2.7 million hectares to more than 4.2 million hectares (Smith, 1995). The area of irrigated land also increased in Tajikistan, by 1.5 times between the early 1960s and the early 1990s, and in Kazakhstan by 1.7 times over the same period (Glazovsky, 1995a). This expansion in irrigation was driven primarily by a desire for self-sufficiency in cotton production in the USSR. 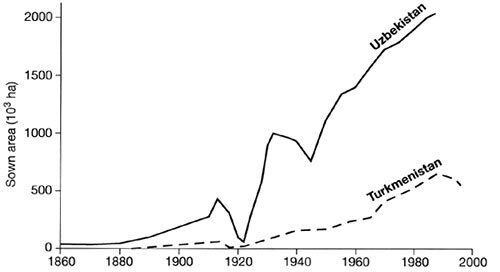 The area of cropland sown to cotton in Uzbekistan increased from 750 000 hectares in 1945 to 2 million hectares by the late 1980s, and in Turkmenistan from 150 000 hectares in 1950 to more than 600 000 in 1988 (Figure 22.2). Irrigation of other crops, particularly fodder crops and rice, is also significant in the region, but cotton is by far the most important in terms of acreage. Most of the irrigated area was expanded close to the two river courses, but in Turkmenistan water from the Amudarya was channelled along the Karakum canal to new irrigation zones in southern areas of the country located hundreds of kilometres from the river (Figure 22.3). Construction of the Karakum canal, one of the world's longest manmade waterways, began in 1954 and had reached Ashgabat eight years later. By 1981, when the fourth phase of construction was completed, the canal was nearly 1100 km in length. In 1986, water from the Amudarya reached the Caspian port of Turkmenbashi City (formerly Krasnovodsk), 270 km further to the east, via a pipeline. In its initial reaches, the Karakum canal is 250 metres wide and 8 metres deep with a conveyance capacity of 650 m3 sec-1 (Hannan and O'Hara, 1998). Runoff from the Amudarya and Syrdarya were the main inputs to the Aral Sea water budget prior to this major expansion of irrigation, with evaporation the largest output (Table 22.1). The dramatic increase in volumes of water diverted to the expanding area of irrigated cropland in Central Asia since the 1950s significantly reduced inflows to the sea, which fell from an average of 56 km-1 over the period 1911-60 to just 2 km3 a-1 in the late 1980s (Table 22.2). Precipitation inputs also declined in the period 1960-90, perhaps in part a negative feedback effect of declining lake levels (see below). Evaporation output also fell over this latter period as a result of the decrease in the surface area of the Aral Sea.